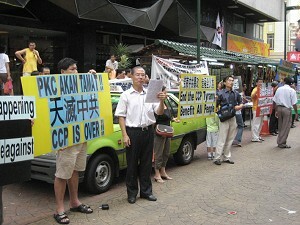 Former Secretary General of the Shanxi Provincial Expert Association of Science and Technology Jia Jia has been closely tailed by spies of the Chinese Communist Party (CCP) since arriving in Malaysia. His laptop was also stolen. He said that for the future of 1.3 billion Chinese people, he will continue to speak out without hesitation to expose the crimes of the CCP. On December 29, Jia's laptop which was placed underneath his legs was stolen while he was sitting at a store in a mall. He only realized that his laptop was stolen after he stood up to leave. He said the laptop was taken away in a flash. It was so quick and swift that it must have been taken away by a professional spy who had been tailing him. Jia said that the laptop stored all his personal and other important information. The CCP wants to know all his actions–where he is staying, what he does, and what activities he is involved in so that they can persecute him at any time. Jia believes the main purpose for stealing his laptop is to find out the democratic reform plans and the names of pro-reformists in the party, government and armed forces, so as to thoroughly eliminate these anti-revolutionary powers. A few days ago, while Jia was jogging near where he was staying, two strangers followed him up the stairs to the floor below and only left when they saw him entering his apartment. On January 8, while Jia was meeting with some people in the hotel lobby, a suspicious looking person was wondering around nearby and when he realized that he was discovered, he went to the front door, made a phone call then left. But soon afterwards, two other Chinese men walked past Jia to a table nearby, one sat down and one remained standing. When Jia walked past the table when leaving, both of them stared at him.